Robert Haig Coxon was born in Montreal, Canada and studied composition at McGill University. 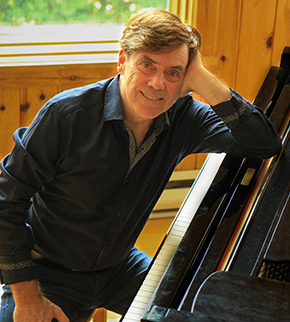 Highly regarded as a multi-keyboardist and world-class composer, Robert draws on a broad range of personal, spiritual and musical experience to create his music for meditation. He has been nominated three times for the prestigious "Felix" award (French equivalent to the Grammy), and slowly became Canada's best-selling New Age artist. In 1995 he released perhaps his best known album to date, Silent Path, which almost instantly became number 1 in Canada and in France. (It also eventually made number 1 in the New Age USA charts as well). The least known part of Robert's work is his interest in trying to test music scientifically... finding where the interdimensional parts are that touch and heal people, as he has seen his music do, for years. He regularly sneaks away to places where he can do scientific research on sound. Robert Haig Coxon’s new album The Silent Path II ...The Healing Heart is by far his most powerful work yet, and definitively worth the wait. 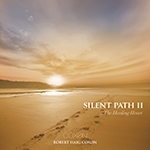 The Silent Path was released in 1995 and has been a world-renowned best-seller for decades; numerous individuals have reported spontaneous healings and miraculous events upon hearing this music. With several decades of composing experience, Robert Haig Coxon’s infinite talent shines directly into our hearts through an array of musical experiences: uplifting, soothing and miraculous. With deliberate coherence, Coxon takes us on a nine-part voyage; each song a spiritual journey, leading us from elevation and revelation, to inspiration and finally acceptance of our own unique journey on this Sacred Path. Whether you are expecting to have an epiphany, meditate or simply relax, spiritual evolution is indeed a side-benefit of Robert Haig Coxon’s new masterpiece. Powerfully peaceful, deeply moving and inspiring, The Silent Path II ...The Healing Heart penetrates the soul, harmonizing body, spirit and mind. "Coxon's creations have an inherent capacity to transport the listener to a world that instills a tremendous harmony..."
"Coxon's warm synthesizer textures and graceful melodies create an optimum setting for relaxation and contemplation. With The Inner Voyage, he shares his most mature and reflective compositions so far." Nominated for the GALA Award! This album provides a catalyst of the listener to transcend time and space... experiencing beauty and harmony, and the essence of the Universe. Can Robert top "Silent Path?" Indeed he did! Strong melody lines with full orchestration and choir backgrounds. This is one of the finest meditation CD's that Robert has ever produced! Culled from the energy of the beautiful music played behind the Kryon channellings worldwide, this music will take you to a very sweet and loving place. Formerly produced as "The Essence of Kryon," this album has been re-orchestrated, re-mixed, and has changed the name and cover. Robert Coxon brings us angelic music with exquisite melodic orchestrations that blend acoustic instruments with rich synthesizer textures and the ethereal sound of a giant sacred bowl, creating an optimum setting for total relaxation and total well-being on all levels. "This first of the Coxon Crystal Silence trilogy pries open the doors of perception and carries the listener into the everlasting arms of pure consciousness."